Cancun is one of the best vacation destinations in North America, if not the world. Its gorgeous white sand beaches, crystal-clear turquoise waters, and wide array of things to see and do attract upwards of three million visitors a year. One of the highlights of any Cancun vacation is, of course, a stay in an all-inclusive resort. You can look for this kind of accommodation online, but it can be a chore to sort through all your options. This is why you should work with Vacatia. 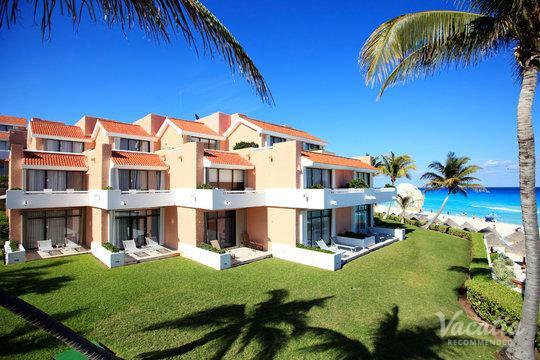 Our comprehensively organized listings make it easy to find Cancun vacation rentals with all-inclusive packages. All of our accommodations have been highly recommended, so you'll only find the top Cancun all-inclusive resorts. If you have any questions, simply start an online chat with a member of our Guest Care team. When you book with Vacatia, you'll know exactly what to expect before you leave home. When people start looking for vacation accommodation, they're likely looking for a little bit of everything. They want the comforts of home in addition to the perks of a resort. This is why we offer something called resort residences. This unique form of accommodation provides you with the best of both worlds. You'll get your own spacious living area and fully equipped kitchen, and you'll often get an in-unit washer/dryer, as well. This means that you'll be able to do a quick load of laundry to keep things light and fresh, prepare some of your own meals to save on food costs, and hang out with your friends and family in your own space. You'll also get all the benefits and services of a high-end resort, including daily housekeeping, concierge check-in, gourmet on-site dining, relaxing spas, fun pools and waterslides, and more. When you book one of Vacatia's all-inclusive resorts in Cancun, you will be all set to discover this world-famous destination. This Mexican city is located on the Yucatan Peninsula, which borders the Caribbean Sea. It is famous for its sizzling nightlife, gorgeous beaches, and all-inclusive resort experiences. There are two distinct areas of Cancun: the traditional downtown of El Centro, and the beachfront string of restaurants, shops, nightclubs, and high-rise hotels known as Zona Hotelera. Cancun attracts all manner of vacationers, from college students on spring break to families to honeymooners. It has beautiful coral reefs where you can snorkel and scuba dive, five challenging golf courses, and world-class amenities. At the end of each incredible day, you can return to one of our Cancun all-inclusive resorts to rest up in comfort and style.